Hello to all of my Great Impressions friends! Welcome to the Great Impressions blog for a bit of inspiration today. Let’s start the day with a card using a new stamp from Great Impressions! For this card, I used an embossing folder and added distress ink. I cut large ovals and stamped the sentiment on the smaller one. I added a little ribbon and a couple of flowers and that finished off this fairly simple card. Thank you so much for stopping by! I hope you enjoyed my card and will stop by my blog to leave me some love! Be sure to come check out our current challenge! If you use a Great Impressions on your project, please link it in our CUSTOMER GALLERY! One last thing! We have a new social media outlet on Flickr.com. You can find us by clicking here, so please join us on Flickr and share your Great Impressions projects! Beautifully done, Ellen! 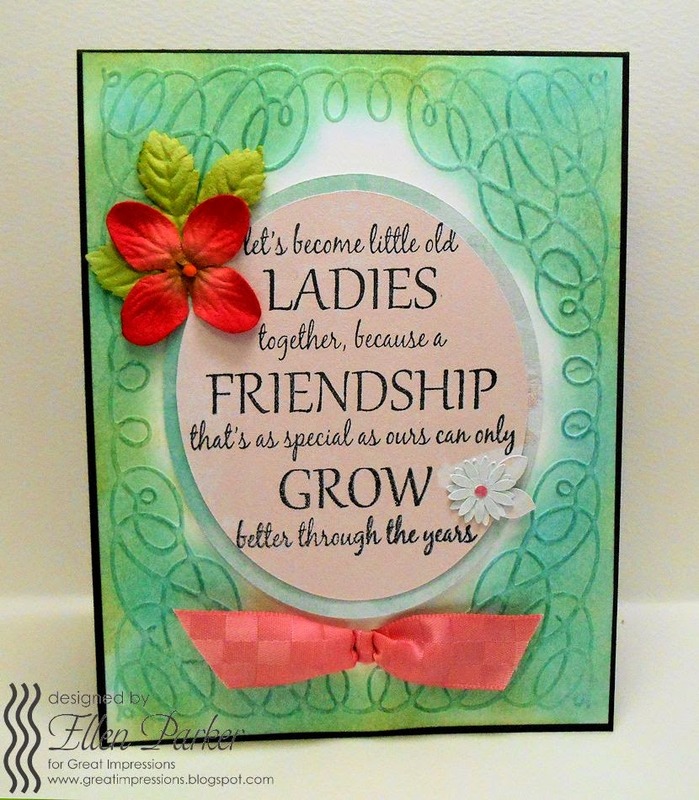 I love that the sentiment is the focal point - what a gorgeous card! How cool that it takes this sentiment from a fun and whimsical thought, to a lovely, serious one! Great job!